Hitler denounced Hess as a madman who had stolen a plane while in the grip of a delusion in order to "broker peace." The German nation, to whom he had been something of a hero, abruptly disowned him. A narrative history of the nuclear attack told from both the Japanese and American viewpoints. The bombs were "our least abhorrent choice," American leaders claimed at the time. USSR: Soviet Marshal Mikhail Nikolaievich Tukhachevsky and seven other Soviet military leaders are shot after confessing under NKVD torture to a plot to overthrow Stalin. Stalin begins purging the Soviet Army of its officer corps. Spain: Day 330 of 985 of the Spanish Civil War. Basque forces withdraw behind their "Ring of Iron" defenses around Bilbao as Nationalist forces press on with their attacks. Spain: Day 695 of 985 of the Spanish Civil War. CBI - China: Day 340 of 2,987 of the 2nd Sino-Japanese War. Day 1 of 139 of the Battle of Wuhan. Japanese troops march into the Hubei province. CBI - China: Day 705 of 2,987 of the 2nd Sino-Japanese War. CBI - Mongolia: Day 32 of 129 of the Battle of Khalkhin Gol, a border dispute between the Soviet Union and Japan. UK: British householders in possession of "Anderson shelters" are required by law have them up and earthed by today. 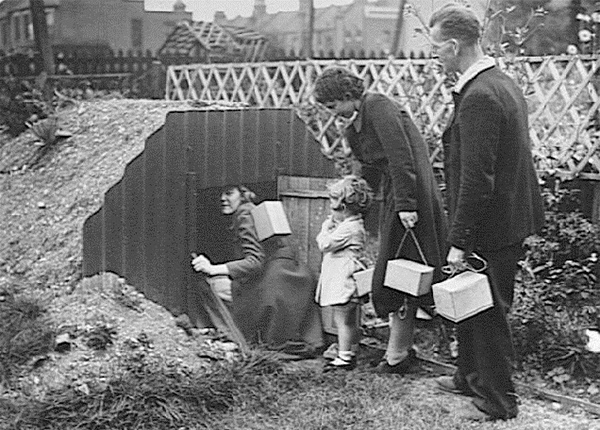 The Anderson shelters, designed in 1938, were personal air-raid shelters that could accommodate up to six people. They consisted of six curved galvanized corrugated steel panels, bolted together at the top, buried 4 feet deep in the soil and then covered with a minimum of 15 inches of soil above the roof. The earth banks could be planted with vegetables and flowers, that at times could be quite an appealing sight. Anderson shelters were issued free to all householders who earned less than £250 a year, and those with a higher income were charged £7. Some 1.5 million shelters of this type were distributed from February 1939 to the outbreak of war. During the war, another 2.1 million were erected. The Anderson shelters performed very well under blast and ground shock. 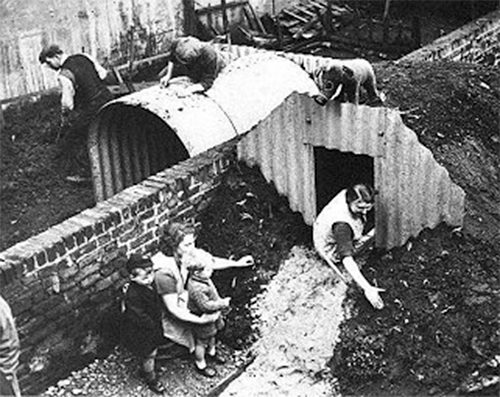 At the end of the war in Europe, all Anderson shelters were expected to be removed and local authorities began the task of reclaiming the corrugated iron. Householders who wished to keep their Anderson shelter (or more likely the valuable metal) could pay a nominal fee. Because of the large number made and their robustness, many Anderson shelters still survive, though many have been converted into storage sheds. Allies: Australia, New Zealand and South Africa declare war on Italy. Atlantic: German subs U-48 and U-101 sink the Greek ships VIOLANDO N GOULANDRIS and MOUNT HYMETTUS off Cape Finisterre, Spain. Nearby, U-46 torpedoes British tanker ATHELPRINCE, but fails to sink her. ETO - Sweden: Crewman of a British Hudson shot down over Norway crosses into Sweden, will be sent back to England on 31 Jul 40. ETO - Norway: The RAF attacks German ships in Trondheim harbor. ETO - France: Day 33 of 44 of the Battle of France. German troops capture Rheims. Paris prepares for a siege as the Luftwaffe pounds the city. MTO - Italy: The RAF attacks Turin and Genoa. MTO - Malta: Italian bombers attack Grand Harbor, Hal Far and Kalafrana. MTO - Libya: British armored cars cross into Libya from Egypt and ambush a number of Italian trucks near Fort Capuzzo. East Africa: Day 2 of 537 of Italy's East African campaign in the lands south of Egypt. Italian planes bomb at Aden and Port Sudan. CBI - China: Day 1,071 of 2,987 of the 2nd Sino-Japanese War. Day 210 of 381 of the Battle of South Guangxi. Day 42 of 49 of the Battle of Yichang. Atlantic: German sub U-79 sinks the Norwegian ship HAVTOR 150 miles west of Iceland. ETO - Germany: After dark, RAF bombers make the first of 20 consecutive nightly raids on the Ruhr and Rhineland industrial areas. MTO - Greece: British sub HMS TORBAY rams and sinks a Greek fishing boat being used as a German troop transport 15 miles south of the island of Lesbos. MTO - Libya: Day 63 of 256 of the Siege of Tobruk. British sub HMS TAKU sinks the German ship TILLY L M RUSS in the Benghazi harbor. Middle East: Day 4 of 37 of the Battle for Syria and Lebanon. East Africa: Day 367 of 537 of Italy's East African campaign in the lands south of Egypt. The 15th Punjab Regiment of the Indian 3rd Battalion captures Assab, Eritrea, Italian East Africa, thus securing the Red Sea. CBI - China: Day 1,436 of 2,987 of the 2nd Sino-Japanese War. Atlantic: Day 149 of 169 of Germany's Second "Happy Time," during which U-boats sink 609 Allied ships with little risk. U-157 sinks the US tanker HAGAN 5 miles north of Cuba. U-boats begin laying mines off Boston, Delaware and the Chesapeake Bay. ETO - UK: A rehearsal for Operation RUTTER, the 2nd Canadian Division's raid against Dieppe is held. Germany: Adolf Eichmann meets with representatives from France, Belgium and Holland to coordinate the deportation of Jews. Russian Front - North: Day 277 of 872 of the Siege of Leningrad. Russian Front - North: Day 38 of 658 of the Siege of the Kholm Pocket. Russian Front - Center: Day 14 of 31 of Operation KREMLIN, a German diversion to trick the Soviets into thinking Moscow is their main objective instead of Stalingrad and the Caucasus. Russian Front - South: Day 225 of 248 of the Siege of Sevastopol, Crimean Peninsula. MTO - Malta: Two Allied convoys trying to reach Malta are attacked by aircraft, warships and submarines. Twelve British warships are sunk while eleven others are damaged. MTO - Libya: Day 17 of 27 of the Battle of Gazala With Bir Hakeim secured, the Germans push on toward El Adem. East Africa: Day 38 of 186 of the Battle of Madagascar. CBI - China: Day 1,801 of 2,987 of the 2nd Sino-Japanese War. Day 28 of 124 of Japan's Zhejiang-Jiangxi Campaign, launched to punish anyone suspected of aiding the Doolittle raiders in China. Roughly 250,000 Chinese will be killed. PTO - Alaska: Day 5 of 435 of the Battle of Kiska, Aleutian Islands. Several USN PBY Catalina planes begin a two-day raid on Japanese ships and positions on Kiska. US 11th Air Force bombs on Kiska Island for the first time. PTO - Malaya: Day 113 of 357 of the Battle of Timor Island. MTO - Italy: Day 1 of 1 of the British Operation CORKSCREW. After an intense 20-day bombing campaign, the invasion of the Italian island of Pantelleria is met with a quick Italian surrender and no casualties. An earlier plan in late 1940 to occupy the island of Pantelleria, between Sicily and Tunisia, was called Operation WORKSHOP. It was aborted when the Luftwaffe strengthened the Axis air threat in the region. Radar installations and the airfield on the island remained a real threat in the MTO, especially to the planned invasion of Sicily. The Italian garrison on the island was 12,000 strong in well-entrenched pillboxes with 21 gun batteries. It was decided to attempt to force the island into submission by aerial and naval bombardment alone. Failing that, an amphibious invasion was planned. The 20-day naval and aerial bombardment of the island began on 03 May 43, with each attack increasing steadily in intensity. A total of 6,202 tons of bombs were dropped on the island. Two demands for the garrison to surrender went unanswered and, on 11 June, the amphibious assault went ahead. About an hour before the landing craft reached the beaches, the accompanying ships opened fire. Unknown to the British attackers, the commander of the garrison on Pantelleria had sought permission to surrender from Rome the previous evening and received it just that morning. 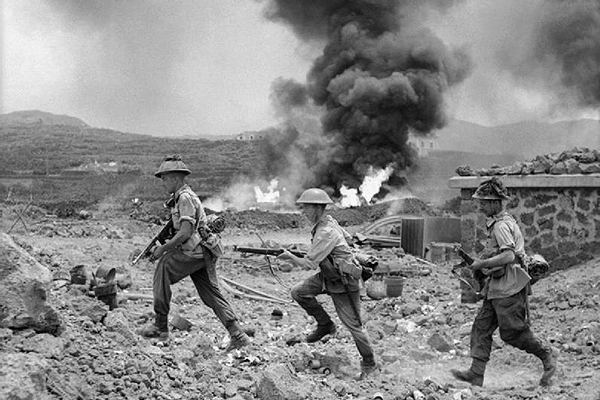 As British Commandos first landed, the Italians surrendered. This is the first known time in WWII that a surrender had been achieved through bombing alone. Churchill later records in his memoirs that the only British casualty was a man bitten by a mule. An assessment by the British reported that the defenses on the island had been reduced to 47% effectiveness by the combing campaign. The Italian garrisons on other nearby islands (Lampedusa and Linosa) quickly fell. This cleared the way for the invasion of Sicily a month later on 09 Jul 43. ETO - Germany: The RAF night bombs at Münster and Düsseldorf, Germany. ETO - Germany: US 8th Air Force: B-17s bomb the U-boat yard at Wilhelmshaven and the port area at Cuxhaven. Germany: Himmler orders the liquidation of all Jewish ghettos in occupied Poland. Russian Front - North: Day 642 of 872 of the Siege of Leningrad. Russian Front - North: Day 403 of 658 of the Siege of the Kholm Pocket. CBI - China: Day 2,166 of 2,987 of the 2nd Sino-Japanese War. US 14th Air Force hits a camp on the Salween River, trucks at Mangshih and warehouses at Tungling. PTO: Day 16 of 47 adrift in a raft for the survivors of B-24 GREEN HORNET that crashed 850 miles from Hawaii. PTO - Alaska: Day 370 of 435 of the Battle of Kiska, Aleutian Islands. US 11th Air Force attacks targets on Kiska Island. PTO - New Guinea: Day 51 of 148 of the 2nd Battle of Lae-Salamaua. US 5th and 13th Air Forces provide air support. PTO - Philippines: The USS FINBACK sinks a Japanese cargo ship. USA: USS MISSOURI, the last battleship built by the United States Navy and future site of the signing of the Japanese Instrument of Surrender, is commissioned. ETO - France: Day 6 of 49 of Operation OVERLORD, the Allied invasion of Normandy, France, known forever simply as D-Day. ETO - France: Day 6 of 62 of the Battle of Caen. ETO - France: Day 6 of 25 of the Battle of Cherbourg. Within this battle begins Day 2 of 5 of the Battle of Carentan. Russian Front - Finland: Day 2 of 11 of the Battle of Vyborg. The Soviets continue their offensive against the Finns on the Karelian Isthmus, north of Leningrad. Russian Front - North: Day 131 of 191 of the Battle of the Narva Isthmus, Estonia. Both German and Soviet troops remain locked in their defensive positions. MTO - Romania: US 15th Air Force B-17s and P-51s bomb at Focsani. MTO - Italy: Day 7 of 16 of the Battle of the Trasimene Line (north of Rome). Allied Air Forces provide air support. The US 5th Army is now 95 miles north of Rome. CBI - Burma: Day 99 of 166 of the UK's Operation THURSDAY. Monsoon season bogs down all operations. CBI - Burma: Day 94 of 147 of the Battle of Myitkyina. US 10th Air Force provides air support. Monsoon season bogs down all operations. CBI - Burma: Day 72 of 302 of the Chinese Salween Offensive. US 14th Air Force provides air support. Monsoon season bogs down all operations. CBI - China: Day 2,532 of 2,987 of the 2nd Sino-Japanese War. Day 56 of 259 of Japan's Operation ICHI-GO. CBI - India: Day 96 of 118 of the Battle of Imphal-Kohima. PTO - Caroline Islands: US 7th Air Force bombs targets in the Truk Atoll during the night and on Ponape Island during the day. PTO - New Guinea: Day 16 of 83 of the Battle of Biak. 5th Air Force provides air support. PTO - New Guinea: Day 180 of 597 of the Battle of New Britain. US 13th Air Force provides air support. PTO - New Guinea: Day 51 of 481 of the Battle of Western New Guinea. 5th Air Force provides air support. PTO - Solomon Islands: Day 224 of 295 of the Battle of the Bougainville Islands. US 13th Air Force provides air support. Czechoslovakia: Local police and civilians continue driving ethnic Germans out of the Sudetenland region of Czechoslovakia. CBI - Burma: Allied SEAC (South East Asia Command) estimates that 108,240 Japanese have been killed in Burma since February 1944. CBI - China: Day 2,897 of 2,987 of the 2nd Sino-Japanese War. Day 72 of 91 of the Battle of Zhijiang. US 14th Air Force provides air support. Japanese troops continue pulling out of China. The USS CAIMAN sinks two Japanese schooners in the South China Sea. PTO - Alaska: US 11th Air Force B-24s bomb installations on Kurabu Cape, Paramushiru Island and in the Kataoka areas of Shimushu Island. PTO - Borneo: Day 2 of 67 of the Battle of North Borneo. PTO - Dutch East Indies: Day 42 of 52 of the Battle of Tarakan Island. The fleet minesweeper USS SALUTE is sunk by a Japanese mine while covering landings at Brunei Bay. PTO - Japan: The USS SEGUNDO sinks the FUKUI MARU. Up north off the coast of Korea in the Sea of Japan, the USS FLYING FISH sinks a Japanese transport. PTO - Japan: Day 72 of 83 of the Battle of Okinawa. PTO - New Guinea: Day 532 of 597 of the Battle of New Britain. US 10th Air Force provides air support. PTO - New Guinea: Day 416 of 481 of the Battle of Western New Guinea. US 10th Air Force provides air support. PTO - Philippines: Day 234 of 299 of the 2nd Battle of the Philippines, aka the Liberation of the Philippines or the Philippines Campaign. PTO - Philippines: Day 179 of 244 of the Battle of Luzon. 5th Air Force provides air support. PTO - Philippines: Day 94 of 159 of the Battle of Mindanao Island. 5th Air Force provides air support. PTO - Philippines: Day 86 of 135 of the Battle of the Visayas region. US 5th and 7th Air Forces provide air support. WWII transformed the Disney Studio. It spent the war years creating and producing training, propaganda, and educational films for the Armed Forces. This extraordinary volume includes Donald Duck's Nazi nightmare "Der Fuehrer's Face" and a host of others - 32 in total - all considered among the best of Disney's work.